Thinking Of Refinancing? Beware Of These Hidden Expenses! Mortgage refinancing can be a great way to lower your monthly payments. If you had a poor credit score previously and you have improved it, you will likely be eligible for a better interest rate. In addition, if you had a small down payment initially, the built-up equity can help you refinance to a better interest rate. However, keep in mind that lowering your interest rate does not guarantee that you will save money. Refinancing a mortgage means you have to go through the full loan application process again. That means paying application fees, closing costs, and other lender fees. If those expenses are high enough, and/or the monthly savings is smaller, you could cost yourself more by refinancing. A lower interest rate generally implies savings. However, if refinancing your loan means adding months or years to your repayment time, that added length may mean you are still left paying more in the long run. This is one point at which working with a real estate lawyer can be particularly beneficial to you. Your current mortgage may include a clause about charging you an additional fee for paying off your loan early. After all, your lender is expecting to make a certain amount of money through interest; they are trying to protect their interests. A real estate lawyer can help you determine if you will be charged an early payoff fee, and whether refinancing is still worth it. One option for refinancing a mortgage is to take the equity that has built up since purchasing your home and receiving cash. Many will choose to do so in order to invest the money, buy a second home, or so on. However, be careful when doing so; removing that equity may mean paying more over the life of the new loan. As we mentioned above, refinancing means going through the full loan application process again. If you do not have enough equity built up, or you have cashed out that equity, you may need to pay for mortgage insurance on the refinance. This can add hundreds of dollars to your monthly payments. A real estate lawyer can provide you with something lenders and mortgage brokers cannot: sound, logical, legally-based, and unbiased advice. 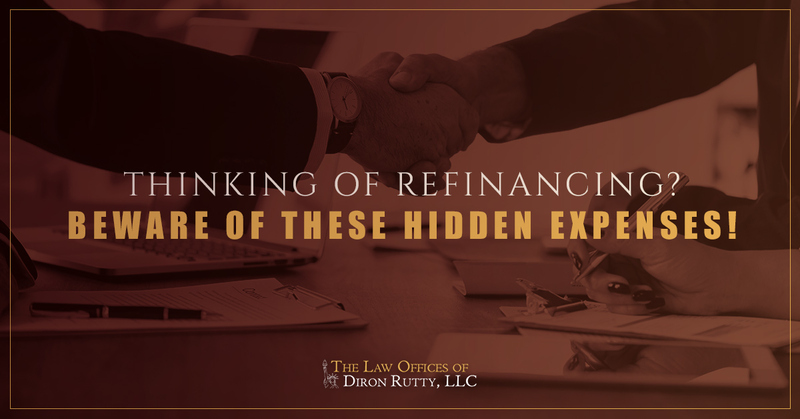 If you are thinking about refinancing your Bronx or New York City-area home, start by scheduling a consultation with the Law Offices of Diron Rutty.